Honestly, Steven...at your pace of life, look into Sarasota for the West Coast and St Augustine for the East. Absolutely awesome gorgeous scenic places that'll have the type of areas you'd love near the beach and I have a feeling they'd be financially feasible. And all jokes about you being OLD...seriously, we're kidding...I play pick up basketball twice a month and can't walk for 3 days. You play fkn hockey and live much more YOLO than most of us. Thanks Jeremy-I know you guys are giving me a hard time. Honestly, I feel like I'm the same age as you guys. So in a great way, you guys also help keep me young! And for that, I thank you and feel like you guys are family. Chevy should offer the back black as an option. I love that look. Agreed. Carbon fiber would be extra slick! holy mother fk, that car sounds amazing. Steven. You are turbo'ing. Don't question us. ^^^ LOL....there's plenty of room under the hood! You must, did you HEAR that thing? I love you guys too, MEKO. It will be interesting to see what the cost is. That sounds absolutely freaking INSANE. My neighbors would despise me if I owned that. Bob, I think MY neighbor does! My next door neighbor and I were talking one day. I told him I'm considering getting a fun, sports car. He said, " I thought your Type S was that car....."
He hasn't spoken to me since the Corvette came home on October 15th. BTW, I meant "INSANE" in a good way. Hey guys, I'm a member of CorvetteForum.com. It is owned by the same people that own AcuraZine. ----The Pfadt "Fugitive" package: Boost your Corvette Stingray to 650HP with a purpose built package composed of Pfadt engineered products designed to work in conjunction with each other to give you factory finish and reliability with Pfadt’s legendary performance. ...are you really considering it? If so, if you think the wife was pissed about the $4K bump for the blue one, how will she react to the $9K you immediately spend on this one? Or will this be a type of deal? Wait until you are super bored with the car and then do something big like a supercharger or turbo to respark your interested in the car. Plus that gives more time for kits to be built by multiple companies and other suckers can see which kits are worth it and which aren't. This. Give it time. Besides, it's a brand new model and some of these aftermarket folks who are rushing to market with these things are likely to have done so without good foundational engineering. I wouldn't want to make a major power modification on this car for a couple of years. 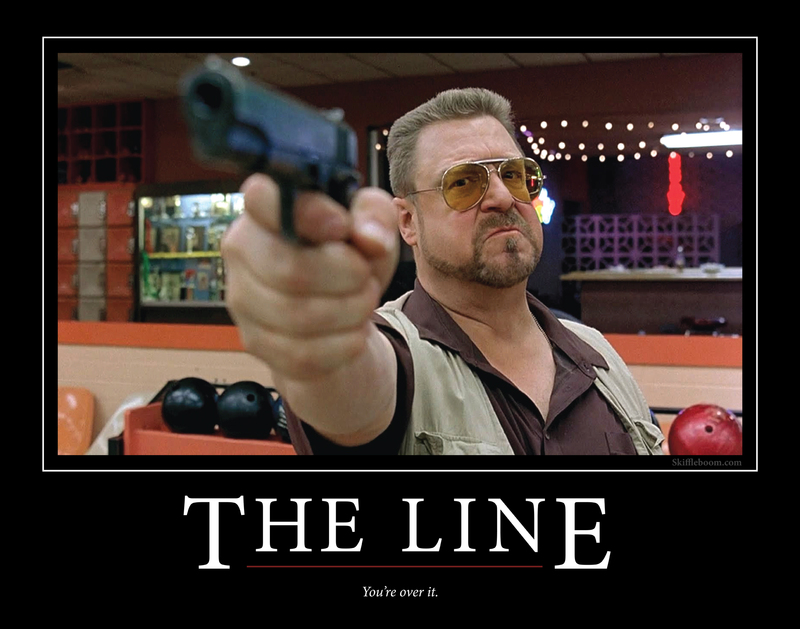 to what Penguin and Tim said. Penguin shure has gotten smarter since he graduated from Kerledge. Guys, I'm not considering it at all. We were discussing it here, and I just happened to find info on it last night. So we know there is one now-I'm more than happy with 460 horsepower! I always try to find an endcap parking space and more outwards....no door dings. 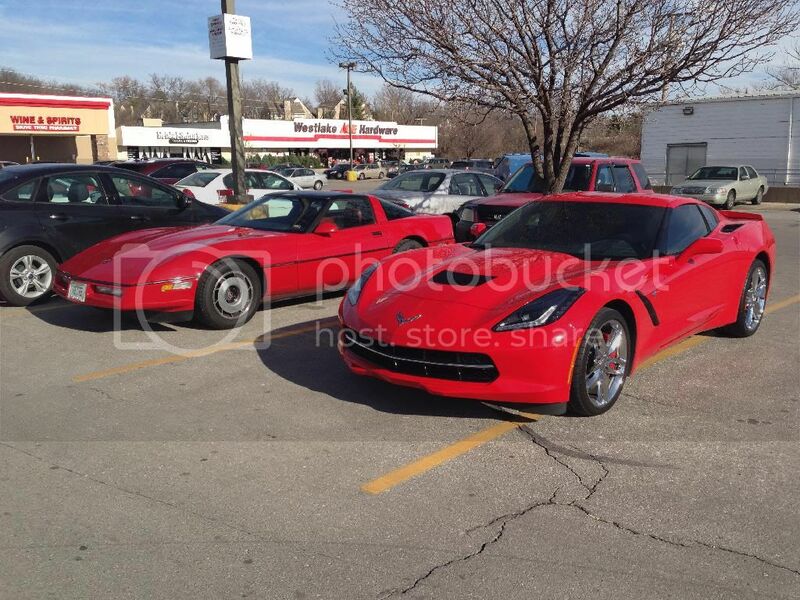 Notice how close the other car is to the older Corvette. Last edited by Steven Bell; 12-18-2013 at 05:31 PM. Shushh Anil.. go buy your own C7 and boost it. Hey Steven...I've been giving that debate some thought lately too for all the people that complain of the S2000 being underpowered. Maybe, down the line I'll feel differently, but for now, the car is an absolute pleasure to drive and has enough get up and go in vtec to not leave you NEEDING more. I'm totally satisfied with it. Drove the dogs down to Mom's last night...35 miles each way...on the drive home, 60 degrees and top down and zero traffic on the turnpike with classic rock station going. I can't think of a time where I enjoyed the drive more, literal zen for me. Steven, regarding the pic, beautiful evolution the Corvette has had over the years. You can tell even with the C7, it still looks a part of the family. Not generally a fan of red, but it really looks great on the C7. Very cool comparison shot! 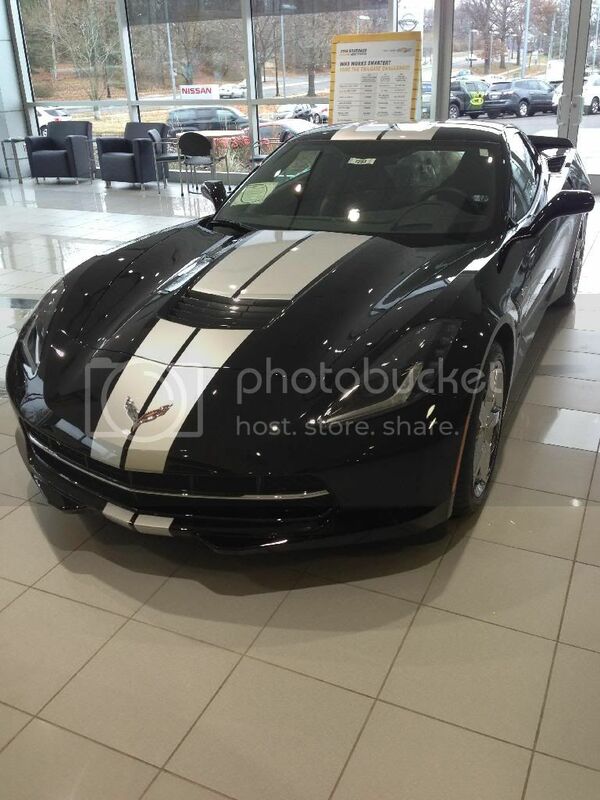 God the C7 just looks better and better each time I see it. You lucky, lucky man! SO, in essence, you're concurring? you are sure now though, arent you? I was also told that the flat-bottomed steering wheel should ship today.....fingers crossed.